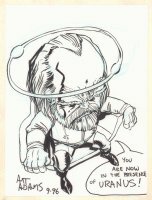 Arthur "Art" Adams is an American comic book artist and writer. He first broke into the American comic book industry with the 1985 Marvel Comics miniseries Longshot. His subsequent interior comics work includes a number Marvel's major books, including The Uncanny X-Men, Excalibur, X-Factor, Fantastic Four, Hulk and Ultimate X, as well books by various other publishers, such as Action Comics, Vampirella, The Rocketeer and The Authority. Adams has also illustrated books featuring characters for which he has a personal love, such as Godzilla, The Creature from the Black Lagoon and Gumby, the latter of which garnered him a 1988 Eisner Award for Best Single Issue. Because of his reputedly tight, labor-intensive penciling style, which was initially influenced by Michael Golden and Walter Simonson, and his admittedly slow pace, Adams does not work as the regular artist on long-running monthly series, but usually pencils stories for short storylines, one-shots, miniseries or contributions to anthologies, such as his 2002 - 2004 work on "Jonni Future", a pulp science fiction series he co-created with Steve Moore for the Wildstorm Productions anthology Tom Strong's Terrific Tales, and his 2008 work on Hulk #7 - 9. 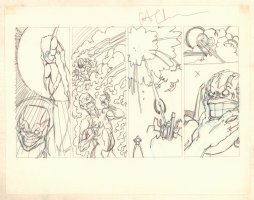 His other published work consists of cover work for books such as Avengers Classic, Wonder Woman and JLA, as well as pinups and other spot illustrations for books such as Sin City, The Official Handbook of the Marvel Universe and his own published sketchbook series, Arthur Adams Sketchbook. He has also done design work for toys and video games, and his drawing style has influenced creators such as J. Scott Campbell.